One year, two friends, 12 new things. On a much smaller scale than Melissa's AWESOME tufted headboard DIY project I just made a cork snake. 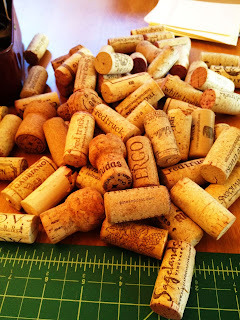 Cork is such a wonderful material it feels wrong to throw away all those wine bottle stoppers. Trivets, cork boards, and other fun doodads can be made from this lovely reused material. I happened upon this sweet up-cycled DIY toy on Domestic Candy--a cute blog out of Germany. Cut 10 corks into quarters. Drill holes through the cork pieces. Thread thick string through a needle and string the cork. Tie a knot between each cork piece. Take a cork for the head and shave it into a desired shape; cut out a mouth. Take the longest needle you have and pull the string through the drilled hole. Tie a final knot; leave a little string hanging out of the mouth as the tongue. Draw eyes on with a sharpie. Notes: Make sure you have a small bit for your drill. You could hand drill each cork piece with an awl but a power drill will shorten the process. When drilling you'll create a bit of cork dust so make sure you working over a designated work space. Wow what a neat idea! 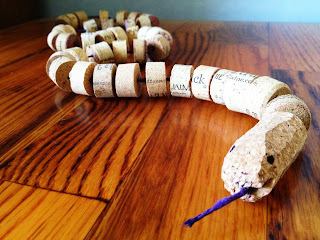 I have a ton of wine corks left over I am planning to do a DIY home decor project for the house. HOWEVER, my son might be interested in making one of these! Way to go! How do you cut the cork? I'm thinking I might make one for my cat! Not sure if he would chew thru the corks? For a better grip when cutting the cork, hold it down with a binder clip. All sorts of info on Pinterest!